Parents trying to keep their children safe in vehicles and comply with the law still may have some difficulty figuring out the best way to protect their offspring. The facts are that three out of four children in car safety seats are not properly secured, or not restrained at all. In many cases, parents are confused about how to install car seats correctly, don’t know that every car seat doesn’t fit every car, or don’t know their vehicle is equipped with the Lower Anchors and Tethers for Children (LATCH) system (or how to use it). Here are some child car seat safety tips every parent can use, starting with general recommendations. Seat selection – Choose a car seat that is based on your child’s age and size, one that fits your vehicle, and use it every time you transport the child. Proper installation – Don’t resort to guesswork. Refer to the specific car seat manufacturer’s instructions on how to install the car seat correctly. Read the owner’s manual for your vehicle on how to install the car seat using the seat belt or LATCH system. Also check the height and weight limits for the particular car seat to ensure your child is within those limits to safely use the seat. Use car seat as long as possible – Maximize your child’s safety by using the car seat as long as possible, providing the child fits within the car seat manufacturer’s height and weight requirements for that particular seat. In addition, safety experts say parents should keep children in the back seat of the vehicle at least through age 12. Birth to 12 months – All children under the age of one should always ride in rear-facing child car seats. Infant-only car seats can only be used rear-facing. Convertible and 3-in-1 car seats typically have higher height and weight limits, meaning parents can use them to keep their child rear-facing for a longer period. A rear-facing car seat has a harness and, in a crash, cradles and moves with the child to reduce stress to the fragile neck and spinal cord areas. 1 to 3 years – The best way to keep your child safe is to use a rear-facing car seat as long as possible. Use until the child reaches the top height or weight limit allowed by the manufacturer of the car seat. When the child outgrows the rear-facing car seat, it’s time to graduate to a forward-facing car seat with a harness. 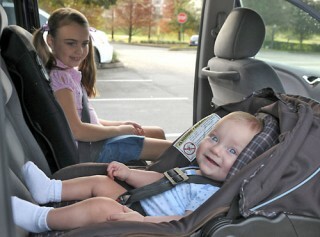 A forward-facing car seat has a harness and a tether to limit the child’s forward movement in a crash. 4 to 7 years – The child should remain in a forward-facing car seat with a harness until outgrowing the car seat manufacturer’s top limit for height and weight. When the child has outgrown this car seat, the child is ready to move on to the car booster seat, still positioned in the back seat of the vehicle. 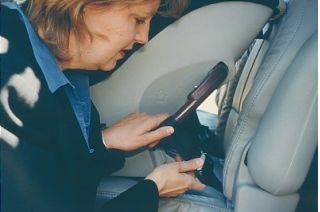 A booster seat positions the seat belt so that it properly fits over the stronger parts of the child’s body. 8 to 12 years – Use the booster seat for your child until the child is big enough to fit in a seat belt properly. Proper seat belt fit means the lap belt fits snugly across the thighs, not the stomach. The shoulder belt should be snug across the child’s shoulder and chest, not crossing the neck or face. Even when the child is big enough for safety belt use, it’s still safer to have the child ride in the back seat. Child car seat inspection stations are available throughout the country to help parents and caregivers ensure car seats are installed correctly. Certified technicians inspect the car seats and provide instruction on how to install them correctly. In most cases, this service is free of charge. Use the NHTSA’s car seat inspection station locator to find a nearby station.